From time to time the Deer Alliance receives queries from home-based stalkers regarding recognition of qualifications and/or hunting competence assessments obtained outside Ireland, such as the British Deer Society DMQ/DSC. For the benefit of such enquirers, we set out below the statement issued by Coillte Teoranta to and through the Deer Alliance Development Committee and Deer Alliance HCAP Assessment Committee in March 2005, when the HCAP programme was formally launched following four years of development and consultation. As will be evident from the statement, it is strict Coillte policy that residents of the Republic of Ireland are required to achieve HCAP Certification as a condition of applying for or holding a licence to hunt deer on Coillte land, or applying for a deer hunting permit as a nominated stalker, by specified dates. Non-residents must either achieve HCAP Certification or provide evidence of having achieved a similar, approved, certified hunting competence assessment. The Deer Alliance HCAP Assessment Committee is the competent authority for determining what constitutes a “similar, approved, certified hunting competence assessment”. “On a phased basis from the 1st of January 2005, all persons intending to hunt deer on Coillte lands will be required to have satisfactorily completed an approved Hunter Competence Assessment Programme. All Irish residents tendering for a licence to hunt wild deer on Coillte lands on, or after the 1st of January 2008 must have satisfactorily completed The Irish Hunter Competence Assessment Programme and provide evidence of this when making their tender. All persons (licensees and nominated hunters) applying for a deer hunting permit for Coillte lands on, or after the 1st of January 2010 must have satisfactorily completed The Irish Hunter Competence Assessment Programme and provide evidence of this when making their application for such permits. This entry was posted in Uncategorized on April 29, 2008 by Liam Nolan. Stalkers will be aware of the publication on February 12, 2008 of Statutory Instrument No. 21 of 2008, which provided for new regulations affecting firearms. In particular, it was intended that a new category of “Restricted” firearms be created, applicable (so far as deerstalkers are concerned) to all firearms of calibre greater than .308. Restricted firearms (to include rifles of calibre greater than .308, also handguns) were, under the new regulations, to be licensed under specific conditions. Unrestricted firearms were to include all rifles of calibre up to and including .308. The commencement date for the new regulations was to have been May 1, 2008. As a result of the judgment of the High Court in the O’Leary case (decided on April 25, 2008 – reported in the Irish Times on April 26, 2008), and as a result of advice to the Government from the Attorney General to the effect that Statutory Instruments giving effect to the firearm amendments must apply to full sections of the Act and not to part sections of the Act, it is now the case that some of the planned roll-out of the new Firearms Code will be delayed at least until the enactment of the Firearms Miscellaneous Bill which is due for publication on the 3rd of July 2008 under the Programme for Government. As a result, the intended classification of Restricted Firearms will not now be applied on the 1st May 2008 as previously planned. It is understood that the Firearms Consultative Panel will be addressing the full implications of the revised situation over coming weeks. Any relevant information received will be posted here. However the Deer Alliance is not represented on the Firearms Consultative Panel. The Irish Deer Society is directly represented and it is understood that Countryside Alliance Ireland indirectly represent other organised deer interests including the Wild Deer Association of Ireland. This entry was posted in Uncategorized on April 28, 2008 by Liam Nolan. The Food Safety Authority of Ireland have opened a new consultation on the FSAI website (www.fsai.ie). This consultation concerns the proposed introduction of National Rules for small quantities of wild game and wild game meat. The proposed rules will impact on all stalkers handling or dealing in venison as a result of their deer management or stalking activities and stalkers are encouraged to participate in the consultation process. The introduction in 2006 of new European Regulations on food hygiene established a “farm to fork” approach to food safety with Regulation (EC) No. 852/2004 laying down common rules for all food businesses and Regulation (EC) 853/2004 applying additional requirements to businesses handling foods of animal origin. The Regulations acknowledge the close existing relationships between consumers and hunters supplying small quantities of wild game and wild game meat locally and so allows for Member Sates to draw up National Rules regulating this activity to ensure protection of public health. With this in mind it is proposed to introduce national legislation in Ireland governing the direct supply by the hunter of small quantities of wild game (as primary product) and wild game meat to the final consumer or to local retail establishments directly supplying the final consumer. Hunting and preparation of game for private domestic consumption in the household of the hunter is exempt from these rules. General hygiene requirements are also outlined as well as specific training requirements for persons who hunt wild game with a view to placing it on the market for human consumption. Left-click on map for larger image, or right-click to print. 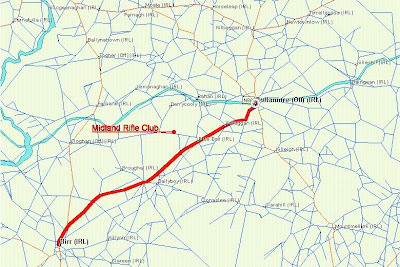 The Midlands Rifle Range (Midlands National Shooting Centre) is located approximately 9 miles from Tullamore, Co. Offaly. Follow the main road from Tullamore to Birr for approximately 7 miles, until you reach Blue Ball cross-roads (the Blue Ball public house is on your right). Turn right at the Blue Ball, follow the road to Shannonbridge and Ferbane for approximately two miles, you will find the Range on your right. This entry was posted in Uncategorized on April 27, 2008 by Liam Nolan. A total of 386 candidates have been certified as competent under the provisions of the Deer Alliance Hunter Competence Assessment Programme since its introduction in April 2005. Twenty-two Multiple Choice Question tests (MCQs) and ten Range Tests have been held between July 2005 and April 2008. Lists of HCAP-Certified Candidates, showing names and HCAP numbers, are posted on this blog after each Range Test (see below, also under “Older Posts”). Candidate numbers only are listed after each MCQ. A breakdown of statistics indicating percentage Pass/Fail rates of MCQs and Range Tests will be posted here shortly. April 6, 2008: The Deer Alliance Stalker Training Manual is currently out of print, with delivery of an updated edition delayed. The new edition will be available shortly and details will be posted on the blogspot as soon as a delivery date is confirmed. All orders on hand will be fulfilled as soon as supplies are available, meanwhile if purchasers wish to cancel orders already submitted, refunds will gladly be provided. This entry was posted in Uncategorized on April 6, 2008 by Liam Nolan.